The Meyers & Venn Team has closed over $250 million in sales representing buyers, sellers and investors. The Meyers & Venn Team was awarded Sales Team of the Year in 2012 and 2013. Curbed "How much for a stylish Midtown one-bedroom with room to spare?" Brick Underground "This $415,000 Midtown studio has a spacious kitchen and a laid-back co-op board"
New York Post "Take a peek inside NYC’s oldest homes for sale"
Les has represented Manhattan buyers, sellers, renters, owners, and investors as a residential real estate specialist for over five years. 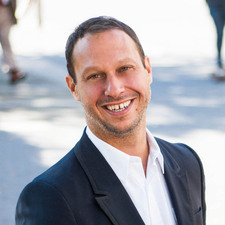 A native New Yorker, his knowledge of the city’s unique neighborhoods, combined with his keen eye for beauty, design, and value, give him a distinct edge in marketing and showcasing properties. Les knows New York as only a true native can. Glorious spaces sometimes hide in unlikely places and lesser-known neighborhoods may offer amazing values. Les prides himself in uncovering gems for his clients and matching their needs with the perfect properties no matter what neighborhood or property type they seek. As a former fashion and travel photographer working for major magazines including Vogue, Elle, and Marie Claire and the son of an art dealer, Les has a unique ability to see the potential of any space. He uses his experience, contacts, and technology to help buyers envision the possibilities for a home after renovations, which expands the list of property choices. His eye for beauty and detail enables sellers who work with him to stage their homes for top-dollar sales. An impressive work ethic, emphasis on discretion, and flair for client service have long been part of Les’s professional fabric. Having lived abroad including Vietnam and Greece and traveled the world as a phototographer gives Les a global perspective on real estate. He understands the demands placed on international clients who come to New York for business, education, or to invest in real estate. The ability to anticipate the current and future needs of such clients is one of many attributes that makes The Meyers Group so successful. Outside of work, Les is devoted to his family. He resides on the Upper East Side with his wife and two children. He loves to cook and host dinner parties, travel, and visit the museums in his neighborhood. He is an avid reader and his iPod is full of soul and jazz.